As we reach peak temperatures this summer, patients may be inquiring about polarized sunwear, transition lenses, and tinted or UV protected lens options. This is the best time to educate patients who currently enjoy outdoor activities such as hunting, fishing, hiking, or biking without polarized lenses. With increasing UV exposure and risk of permanent eye damage, polarized lenses are becoming more of a necessity than an optional fix. It doesn't hurt that your optometry practice could benefit from a second pair sale. Let us show you why stocking your optical dispensary with a range of polarized glasses will benefit both your active patients as well as your practice's profits. Polarized lenses reduce eye strain, block glare, could be fitted with prescriptions, and often come with a UV blocking coating. However, not all polarization is created equal! Some low-quality polarized sunglasses may only cut out 10% of reflected light. Make sure your patients are aware of the quality of lenses they are purchasing as well as the difference between sunglasses with UV protection and tinted sunglasses. Tinted sunglasses are not polarized and don't necessary block UV light or blue light emitted from computer screens. UV coated polarized glasses are ideal for a patient whose lifestyle involves long hours of daytime driving, outdoor activity, or working in the snow. First and foremost, your entire staff should try their own pairs, post pictures on your social media pages, and recommend them to anyone that walks into your practice. People browsing your dispensary may try on polarized lenses, but not realize the difference between polarization and non-polarization. Make sure you're providing photo examples as well as demonstration lenses on top of verbal explanations. If you're already encouraging your optician to recommend prescription sunglasses to all patients, make sure they have an effective demonstration routine. For example, they could take the patient outside and compare regular sunglasses to polarized lenses to show the difference in color quality and reduced glare. There are also glare boxes that patients can look into to see the effectiveness of the polarization. In order to keep sales for your sunglasses steady after the summer ends, you can run promotions and offer coupons to patients who are good candidates for polarized lenses. Patients who have had corrective surgery, sensitive eyes, or cataracts will more than likely need polarized lenses. Most people aren't aware that polarization increases their comfort and can help prevent eye problems down the line. 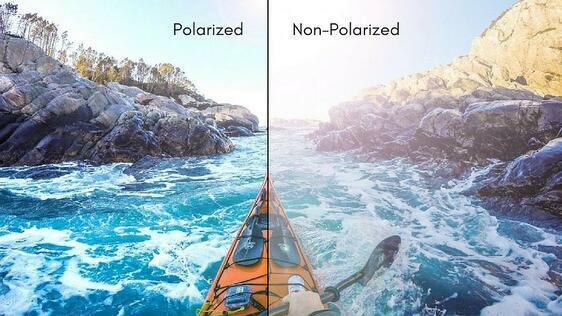 If you market sunglasses to all your patients and conduct convincing demonstrations, your customer base might end up purchasing polarized over unpolarized lenses. Want more tips on maximizing your dispensary profits? Read our ebook below.